“Mary Queen of Scots” stars Saoirse Ronan in the title role. It’s a good time for queens on the screen. “The Favourite” casts Olivia Colman as a gloriously dysfunctional Queen Anne — this ahead of the actress taking over the role of Queen Elizabeth II from Claire Foy in Netflix’s “The Crown” — and now we have the noble Irish actress Saoirse Ronan portraying the noble Scottish martyr Mary Stuart and going royal head to royalhead with Margot Robbie’s Elizabeth I. It opens Dec. 14 at Boston-area theaters. Only one of those heads will remain connected to the royal body, of course. The story of Mary Stuart, Queen of Scots, is a grudge match historically and narratively irresistible: Protestant vs. Catholic, Scottish vs. English, cousin vs. cousin. The twist of Josie Rourke’s film — and it’s a rich one, if only intermittently realized — is that the struggle is deceptively sister vs. sister, and the real rivals are not each other but all those cursed men. The biggest challenge: How do you dramatize a conflict between two monarchs who never met? Answer: By creative and sometimes wearyingly constant intercutting and, in the final act, by cooking up a secret meeting on the borderlands of England and Scotland that almost certainly never happened but that could have and (the film argues) should have. It’s a pretty good payoff, too, as the two rulers size each other up with sympathy, strength, and, in the end, a little too much pride. 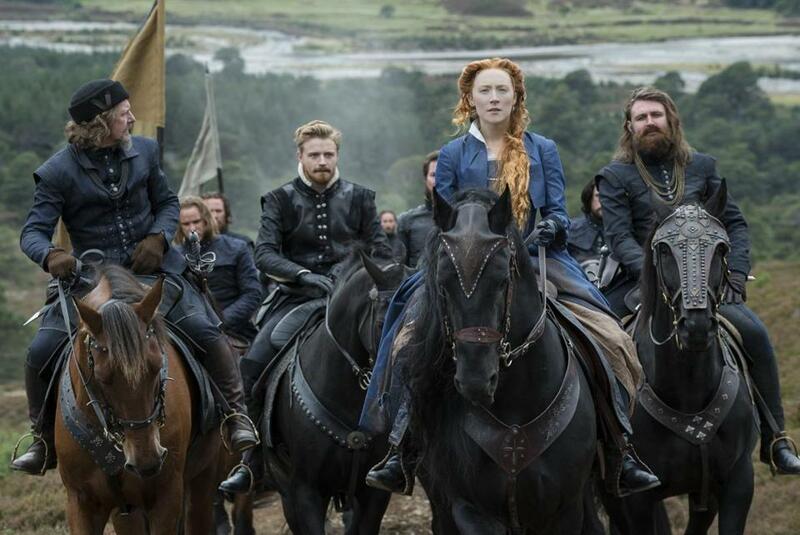 Surprisingly, “Mary Queen of Scots” is less interested in the bloody endgame of Mary’s ambitions and Elizabeth’s containment of them than in the separate war of wills between each queen and the halls of noblemen over whom they rule — men who chafe at being led by women and do what they can to undermine their sovereigns. Mary returns to Scotland from years in France in only partial triumph, beloved by her people, mistrusted by her half-brother, the Earl of Moray (James McArdle), and condemned as the Whore of Babylon by the Protestant preacher John Knox, played by David Tennant as a two-dimensional religious rageaholic. Ronan is a solid Mary, elegant, arrogant, and naive all at once. Robbie seems miscast at first but deepens into the part, especially after Elizabeth survives smallpox with a ruined yet imperious visage. “Mary Queen of Scots” is a historical epic that understands the risks and dangers faced by women in positions of power coveted by men. The film is feminist in spirit and deeply and interestingly empathetic in the playing. It’s rocky going nevertheless. Rourke is a storied British stage director — currently the artistic director of London’s Donmar Warehouse theater — who makes her film debut here. She gets the scenery right and the performances, but the movie is less a movie than a collection of scenes lined up in a row, and the tone wobbles between pomp and circumstantial melodrama. The problem, it seems, is that Rourke hasn’t yet learned to speak the language of cinema with fluency. Scenes and characters blend into each other as a result, and good actors like McArdle, Martin Compston (as Mary’s protector-turned-turncoat Lord Bothwell), Ian Hart (as Lord Maitland), Guy Pearce (as Elizabeth’s chief adviser William Cecil), and Joe Alwyn (as her lover Robert Dudley) tend to get lost in the shuffle. When Mary takes an interest in Henry, Lord Darnley (Jack Lowden), a dashing English Catholic, he’s presented as a sympathetic intellectual and emotional equal (with appealingly broad-minded sexual proclivities), then, in rapid succession, a rake, an abuser, a traitor, and a fool; he’s not a character but a series of plot necessities. Similarly, a conspiracy against one of Mary’s courtiers, a gay troubadour (Ismael Cruz Cordova), feels invented or embroidered despite being part of the actual record. In addition, the decision to cast some roles with racially diverse actors — an accepted and welcome stage practice — is more jarring in the supposedly realistic confines of a historical drama. If Rourke is taking a free hand here (one might be tempted to wonder), what else is embellished? All these hesitancies blunt the impact of “Mary Queen of Scots” and keep it from being what it wants to be: a smart, sorrowful refocusing of history’s lens on two powerful women whose commonalities outweighed their differences. It’s in every sense a noble failure. Here’s hoping that doesn’t stop Rourke from trying her hand at movies again. Directed by Josie Rourke. Written by Beau Willamon. Starring Saoirse Ronan, Margot Robbie, Joe Alwyn, Guy Pearce. At Boston Common, Coolidge Corner, and Kendall Square. 124 minutes. R (some violence and sexuality).